View more presentations from steveheye. 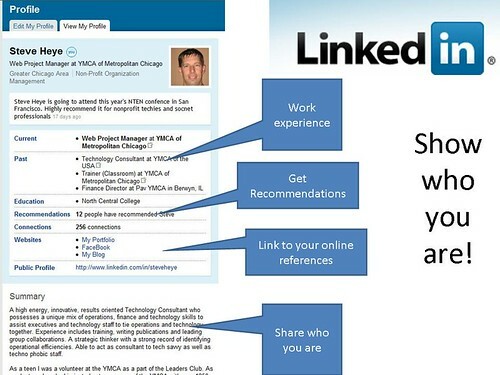 My colleague, Steve Heye,and fellow chapter author for the NTEN book, Managing Your Mission To Meet Technology, created the above slidedeck for a career training workshop at the YMCA. It's about using social networking tools to support your career. Slide 44: Some good time management tips for using the social web purposefully. Steve has some good tips on how to use LinkedIn. 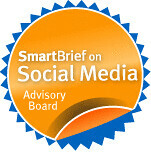 If you do this again, I would recommend checking out Dan Schawbel's book "ME 2.0"
I would love it Steve, if you were to write a resource rich post about the art and science of using LinkedIn - not only to build your career, but as a professional networking tool on behalf of your nonprofit organization. Any takers out there? Leave me a comment with pointer to your blog post or best resources or del.icio.us links. It seems really awesome - you raise money and raise awareness about your organization, while they do all the work for you. I definitely think it's worth looking into! Love the assignment and hope that someone who knows what they are doing with linkedin will take you up on it. Would love to see that spelled out with a specific objective in mind. We're going to be discussing ways that nonprofit executives can advance their organizations through having a LinkedIn presence, beyond the obvious increase in visibility and putting a face to the organization. - it's not just a resume for job hunts, it's also an opportunity to make a good impression and even connect with community members and potential donors, sponsors, volunteers, partners, and vendors. Depending on your audience and resources, there may be opportunities for LinkedIn groups to foster a community of individuals interested in your work, for connecting members, volunteers, or staff. However, I'm still looking for some examples of thriving LinkedIn nonprofit groups - PLEASE SHARE IF YOU KNOW OF GOOD EXAMPLES! Would love to see more writing on examples of nonprofits that are making the most of LinkedIn.